Wines of Crete is an extremely interesting initiative, thanks to which it is possible to get to know local Cretan wineries. Being in Crete, it is worth trying to visit one of such places. 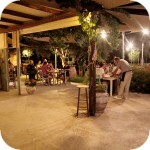 We would like to invite you to visit the Tasting room at the wine bar belonging to the Moni Toplou monastery. From the outside, this plant makes an impression of being extremely modern and very neat. Behind a solid wall, a number of several modern buildings have been built, whose aesthetics perfectly fits the Cretan architecture. In the basement of the main building there is the previously mentioned Tasting room, where you will be able to taste one of the three types of wines produced here on site. The tasting of oil is also intended for tasting, which is obtained from olives grown on the surrounding hills. It is worth talking with employees who will be happy to tell you about the local products. We have learned, among other things, that only one type of wine (red or white) is stored in barrels at a given moment. For the production of red wines are used fruits of three species of vines. By the way, we would like to thank the employees of the Moni Toplou winery for making photos depicting the interior of this extremely modern facility. Returning, however, to the topic of wine, we must admit that the red wine Liatiko-Mandilari charmed us the most. Despite the quite high alcohol content, because it reaches over 13%, the wine is very delicate and after cooling it has a pleasant slightly dry taste. After a day of intense sightseeing, it was a perfect complement to the evening supper. Interestingly, although usually on hot days we are much more likely to reach for pink wines, however, it is the ones produced in Moni Toplo that did not enchant us as much as red wine. Rose Toplou rose wine formed as a mixture of three types of wines, was noticeably more intense in taste and was definitely more dry. However, if you are on the spot, we recommend tasting all available liquors. It's good to get your own opinion and decide to buy the chosen favorite. If we write that prices are affordable and really attractive, it will be hard to say. For a bottle of excellent red wine Liatiko-Mandilari, we paid only 8.5 €. And it is worth adding that exactly the same product sold in Chania cost already more than 20 €. Unfortunately, despite the fact that this place is located next to one of the more frequented roads leading to the beach of Vai, it is hard to say that the winery of the monastery of Moni Toplu, enjoyed a special popularity. During our several-dozen-minute visits, we passed here with a couple of other tourists. It's a shame because this unusual place allows you not only to taste local wines, but also to get interesting information related to their production. A small signpost directing to this place can be found on many sections of the eastern part of the Nowa Droga Narodowa. The last of them pointing the way directly to the wine cellar is located next to a small parking lot, where buses stopping tourists bringing visitors to Moni Toplou monastery stop. From here, the wine bar is only a few hundred meters away. If you add this place to your holiday plans, remember, however, that it is only open on weekdays from 9 to 16. It is true that it is also possible to visit at weekends, however, then a telephone confirmation is required.